As much as I wanted to believe that Hope was alright she wasnt acting like she normally did when I walked in the room. I had so much I wanted to do with her and not enought time before all the fame would step in and no alone time. I sat down by Hope. I put my arms around her. "On the next stop I want me and you to go just us two before the first show tonight." Jason said I smiled to that and said that sounds amazing. He gave me those sweet kisses and it was amazing it made my heart jump for joy I couldn&apos;t believe that I was living this amazing life with an amazing man. The kissing lead to other things and we are both laying in bed cuddled up skin on skin and fell asleep. A few hours later we were woke up by one of Jason band members saying that we are in Indianapolis Indiana. We got up and got dressed and before leaving the room I grabbed Jason and kissed him. "I love you baby." he said "I love you too." I said. we walked out hand and hand and got off the bus. Jason didn&apos;t tell me where we were going but I knew as long as I was with him I knew it be amazing. we got in Jason&apos;s truck and we headed down the road the next thing I knew we were parked in the parking lot of the zoo. Jason got out and came over to my door and opened it. We headed to the front entrance and he got tickets for us but also special seating for the dolphin show. we got to spend the next few hours just talking to the trainers and learning some hand signals and then we were able to work with them. Later on they said we could get in the water with them if we wanted too. So Jason and I decided too. We both got in the water and two dolphins swam up to us and we grabbed the fins and away we went around the pool. one of the dolphins name was Winter she was a rescue dolphin who was found washed up on land with a net cutting off her circulation and the only possible way to save her was her losing her tail so she had a prosthetic. The other dolphins name was Faith. After we finished with swimming with Winter and Faith we got out and dried off and thanked the trainers for taking the time out for us. Before we left we waved good bye and to my surprise so did the dolphins also waved.. We headed back out and walked around some more. I could tell Hope was having a wonderful time. Her eyes were lite up so much and she was smiling ear to ear. I put my arm around her and we walked and talked and just enjoyed the nice warm air and being together means everything to me. I though about how better it could be and how I wanted every second of everyday with her. So I knew what I had to do and it would happen tonight. I just had to figure out how I could keep this secret til tonight and how I could get what I needed but as much as I hated keeping anything from her in the end it be worth every thing. We walked around a few more hours and then went to the dolphin show. We left after the dolphin show and we headed to the mall. when we got to the mall I let Hope pick where she wanted to go. To my surprise Jason wanted to go to the mall so when we got there he said we could go anywhere I wanted to go so I decided to go to Debs and find a cute dress for tonight. I searched for a long time and Jason comes over and said he needed to run to a few places and that he meet back up with me. I told him that was fine and he kissed me and said he loved me. I love you too babe I said as he took off. After searching for a bit I found a cute black dress with blue around it super cute and a cute pair of shoes I headed from there to Victoria secrete to find some cute bras and undies then to bath and body works for perfume and then to Clair&apos;s to find some belly rings. After finding the rest of what I needed I went and sat down and waited for Jason to come back. I set there and checked some things on my phone and Jason called me and found out where I was. I told him where I was and he met up with me and we headed back to his truck. we stopped to eat then headed back to meet up with his band they were setting up at the fair grounds for that night. 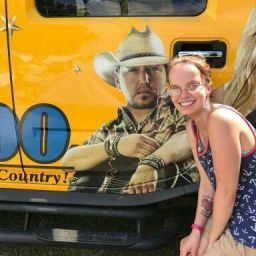 I knew it be a sold out show, I took everything to the bus and I sat there and the next thing I knew my phone was ringing and to my surprise it  was Holly she called to tell me that her and Brantley were at the fair also so I told her where to meet me and then told Jason that I was going to meet them and he also joined me. We met up and me and Holly talked and she said that Brantley was performing here before Jason was. I was really excited because I was with my bestie again even if it was just for a few hours. we spent the next few hours walking around and talking then the guys took off to the stage to finish the last of what they needed. why talking to Holly and catchin up my phone rings and I answered it getting the shock of my life it was a friend I haven&apos;t talked to in a couple years Emily me and her were super close but when she moved we lost contact and then found each other we talk here in there but then we just stopped talking. she told me that she was also there at the fair for the concert tonight so we met up with her and her fiancée. when I told them that I was dating Jason they were really surprised. After a while we headed over and sat in the grand stands and waited for the guys to come back so I introduced Jason to Emily and Ricky. "Would y&apos;all like track seats to the show tonight?" Jason asked "That be great thanks man." Ricky said. he offered to help get the last bit of stuff to set up so I took Emily and Holly to the bus to show them the cute outfit I got for tonight. We talked some more and then jumped in the shower and got ready for tonight.